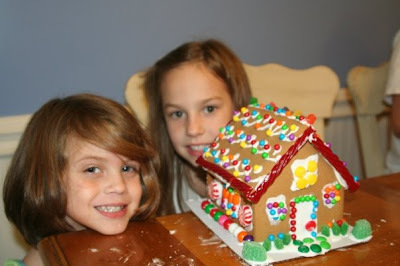 Ana & Lacy with the gingerbread house they made! The four teams working hard to build the best gingerbread house! Ana has a virus. They are watching it closely to avoid any serious infections. Her cough sounds a little bit better this evening. If the fever is not gone by Saturday she will have to be reevaluated by the pediatrician. Things are busy here... our church musical is tomorrow, Baden's birthday party Saturday, the church Christmas party on Sunday, Monday the ST and teacher from school are coming, the ice skating party Tuesday, therapy Thursday, and Friday is the last day of school! Then the family begins to arrive on next Saturday!! Tis' the season!! We love Christmas around here! We pray the girls are 100% on Christmas Eve, because that is the night we go caroling with our friends and family! That is all for now! Please send up those prayers for Ana! This year we are asking all of our family and friends to make ornaments for our tree. We will only use ornaments made by them this year... to remind us of how much we have to be thankful for. God has given us a wonderful support system and we hope to display that through our tree! On Christmas Day we will post a picture of the tree for all to see. If you would like to mail an ornament for our tree you will have to e-mail me to get the address or if you see us you can give it to us then.